Ah the '70s! I remember collecting the original Star Wars toys. They were good, they were very good, but Hasbro's new line is so much better. And they are cheap too. £15 gets you a meaty little monster in the form of the terrifying part lizard/part praying mantis that is known as the acklay. It's jointed appendages allow it to be articulated more than anyone really needs it to be and there are a few other features that show that Hasbro are really putting a lot of thought into the new generation of Star Wars figures and playsets. 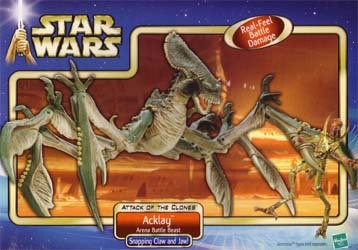 The acklay can suffer battle damage, thanks to its removable guts (yuck!). There is a panel in the figures chest which can be removed, and out spills its innards. It also has snapping claws and mouth so that it can grab and devour any enemy that gets in its way. It really does look the business, and it is certainly one toy that should be on every Star Wars fans "wants" list.